The early 6-series led their similarly-priced Android counterparts with better screens, cameras and chipsets. Market pressure has brought Androids up to par, but now the Lumia 640 makes a bid to regain the lead. This starts at the screen. Even cheapo phones are getting big screens and phablets are pushing into the lower mid-range. To stay competitive Microsoft went with a 5″ diagonal and didn’t skimp on it either. The 720p resolution is necessary at this size to keep text readable, not flagship sharp but small or thin text is easily legible. It’s an IPS matrix, meaning viewing angles are pretty good. ClearBlack offers a competitive advantage by reducing glare and keeping the screen legible in the sun. These affordable screens are rarely brightness champs (this one doesn’t seem one either) so glare can be a huge issue. Oh and there’s Gorilla Glass 3, which is now fairly common but far from standard at this price point. Next up is the camera. On paper the Lumia 640 camera beats most Androids in its class, it takes 8MP stills and records 1080p video. It’s a tiny 1/4″ sensor though, so it’s not going to be the best 8MP shooter. It only needs to beat sub-€200 though and many of them have tiny sensors of their own, capped at 5MP/720p. A 1MP/720p selfie camera will do fine for basic Instagram duties with the right filter. Microsoft ticks all the right checkboxes in the connectivity department. Want LTE? Want dual-SIM? Sure thing, you can have both too, but you can’t have neither. That is, there’s no single-SIM 3G version, not that we’re complaining. And this isn’t one of those half-baked solutions where putting in a microSD blocks your second SIM slot. These three features are the most noticeable for the casual user. A bad screen is a constant nag, slow-loading pages test our patience and noisy photos don’t get as much online approval from your friends. Obviously the balance sheet demands balance. The first thing to go was the headset – there isn’t one in the box. The chipset is nothing special either. While Windows Phone runs smoothly on Snapdragon 400 with 1GB RAM, it’s essentially the same setup all affordable Lumias use aside from the baby 4-series. 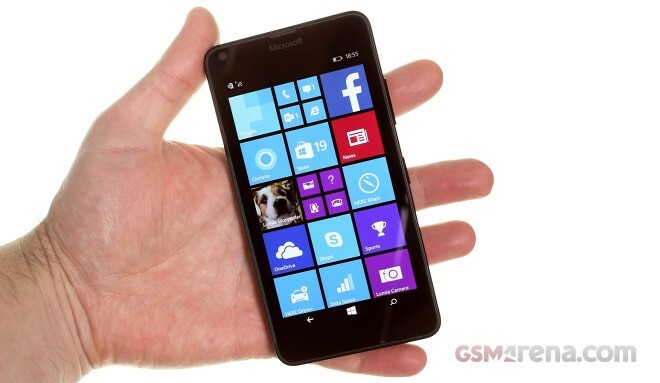 The Microsoft Lumia 640 is made of polycarbonate like so many of its predecessors. It’s available in both matte and glossy finish. It’s not the same quality as the flagship Lumias have though. In the hand, the phone feels a bit large for a 5″ device, especially one with no hardware keys or stereo speakers on the front. It’s still easy enough to handle and fairly thin too, at 8.8mm it fits a 2,500mAh battery. That’s bigger than most affordable phones get. The back cover and battery are removable for extra flexibility. The Microsoft Lumia 640 is already in for a review, so stay tuned in a week or so for the full rundown of what it can and what it can’t do for you.